Mezco Toyz continues to unveil its 2012 line-up for San Diego Comic-Con, and The Blot is excited to see how many female characters from the DC Universe have been included! The Blot loves this version of Catwoman; it’s just too bad Christopher Nolan didn’t use this look in this summer’s The Dark Knight Rises! 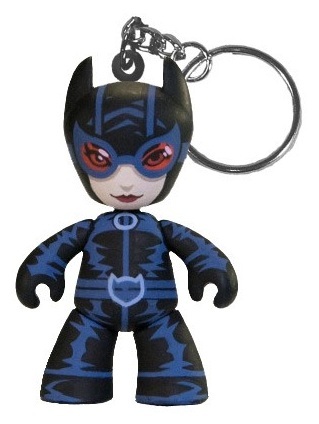 This San Diego Comic-Con 2012 Exclusive Catwoman DC Universe Mez-Itz Key Chain stands 2” tall, features 5 points of articulation and a sturdy metal clasp. The SDCC 2012 Exclusive Catwoman Mini-Mez-Itz Vinyl Figure Key Chain by Mezco Toyz is a non-numbered limited edition toy and will retail for $8 each at Mezco’s SDCC booth. For those of us unable to attend SDCC, you can pre-order this awesome figure at Mezco Toyz’ online store (while supplies last). DKE is seriously bringing the heat at San Diego Comic-Con this year! Every announcement has been better than the last. Just check out these adorable 5” flocked Treeson by Crazy Label and Bubi Au Yeung. I know lots of Treeson fans worldwide that will be dying to get their hands on these pink and minty green figures. Each colorway of the San Diego Comic-Con 2012 Exclusive Flocked Treeson by Crazy Label & Bubi Au Yeung have a limited edition run size of 150 pieces, will retail for $40 and can be purchased at DKE Toys’ SDCC booth #4728. 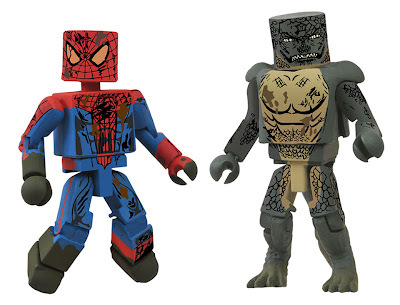 In this summer's surefire blockbuster movie The Amazing Spider-Man, Spidey and the ferocious Lizard will do battle under the streets of New York City, and Diamond Select Toys is adding to their popular The Amazing Spider-Man Movie Minimates toy line with this San Diego Comic-Con 2012 Exclusive ASM Sewer Battle Marvel Minimates 2 pack! This SDCC Set includes sewer splashed versions of Spider-Man and the Lizard as collectible 2” minifigures. These figures will be available for purchase from Diamond Comic Distributors’ SDCC booth #2401 and Diamond Select Toys’ SDCC booth #2607. But if like The Blot you can't make it to SDCC this summer, you can pre-order this set from Entertainment Earth for $8.99 here. Mezco Toyz has a really exciting line up of San Diego Comic-Con exclusives this year. The Blot especially loves this Metallic Wonder Woman DC Universe Mez-Itz. Not only does it have a SDCC exclusive metallic paint job, but it is the first female character in Mezco’s DC Comics toy line and the first to feature sculpted hair (which I think turned out really nice!). 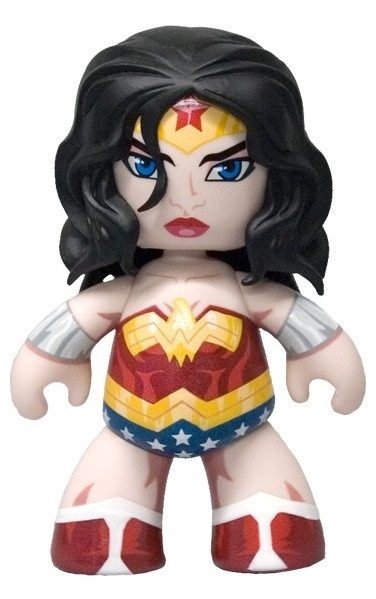 DC’s Amazon warrior princess stands 6” tall, features 5 points of articulation, and includes a real Lasso of Truth! The San Diego Comic-Con 2012 Exclusive Metallic Wonder Woman Mez-Itz vinyl figure by Mezco Toyz is a non-numbered limited edition toy and will retail for $20 each at Mezco’s SDCC booth. For those of us unable to attend SDCC, you can pre-order this awesome figure at Mezco Toyz’ online store (while supplies last). This is exactly the kind of collaboration that really gets The Blot excited about a San Diego Comic-Con exclusive. 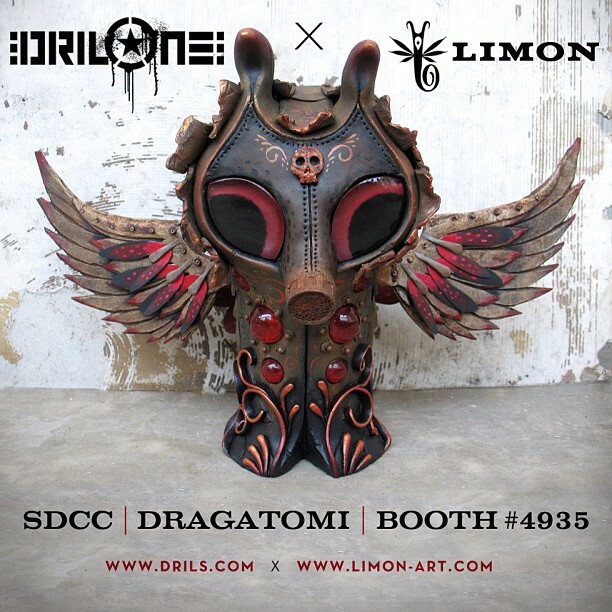 Jason Limon has teamed up with DrilOne on this beautiful custom Ollie (No. 7) sculpture That stands 8” tall and has a wingspan of 12”. These two super talented artist have teamed up to create a truly stunning piece you will not want to miss at SDCC 2012! 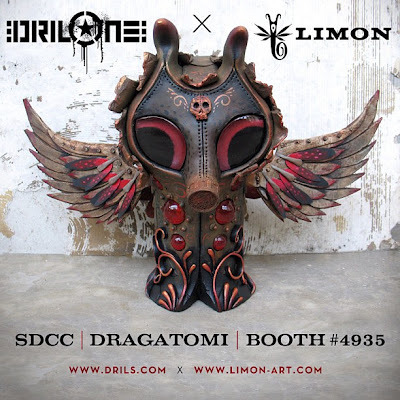 DrilOne x Jason Limon San Diego Comic-Con 2012 Exclusive Ollie (No. 7) will be available for purchase at Dragatomi’s SDCC booth #4935 on July 12, 2012 at 2pm. 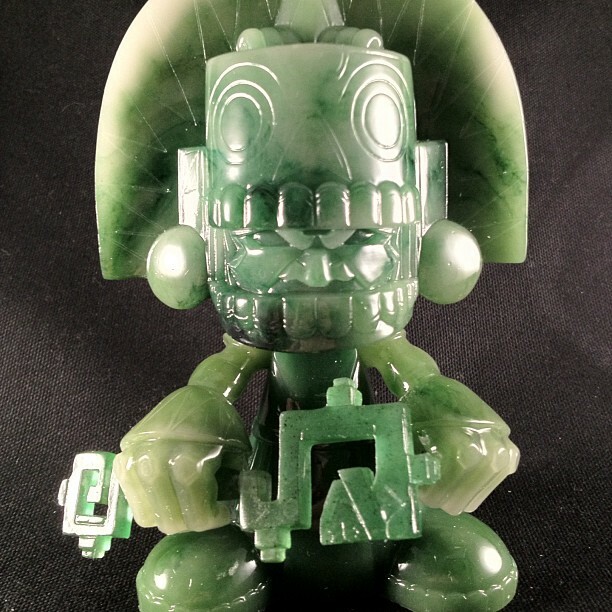 There are so many amazing San Diego Comic-Con 2012 exclusives being announced every day now, but one not to be missed is the Jade Mictlan by Jesse Hernandez! This is only the second resin Mictlan released by Jesse and Kuso Vinyl, but it might be my favorite Mictlan released to date. How beautiful are the swirls of green in this figure? The San Diego Comic-Con 2012 Exclusive Jade Mictlan by Jesse Hernandez has a limited edition run size of just 25 pieces and can be purchased at Kuso Vinyl’s SDCC booth #4937 on Friday, July 13th, from noon to 2pm. Mezco Toyz’ Mega Mez-Itz is back! After the success of their SDCC 2011 Exclusive Batman Mega Mez-Itz, Mezco is now releasing a 300% Batman Mez-Itz based on Batman’s look from the upcoming summer blockbuster The Dark Knight Rises. 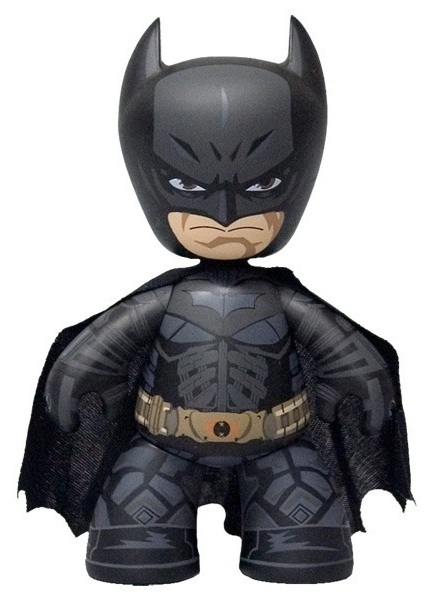 This San Diego Comic-Con 2012 Exclusive The Dark Knight Rises Batman Mega Mez-Itz stands 20" from the tip of his ears to the soles of his bat-boots, and features a real cloth black cape. Just like standard Mez-Itz viny figure, this giant toy features 5 points of articulation and comes securely packaged in a sturdy full color window box (the size of a dorm fridge!). The San Diego Comic-Con 2012 Exclusive The Dark Knight Rises Batman Mega Mez-Itz vinyl figure by Mezco Toyz is a non-numbered limited edition toy and will retail for $200 each at Mezco’s SDCC booth. For those of us unable to attend SDCC, you can pre-order this awesome figure at Mezco Toyz’ online store (while supplies last). Earlier this month Medicom released Be@rbrick Series 24, its newest 100% Be@rbrick blind box series that The Blot knows pop culture fans are going to go crazy over. 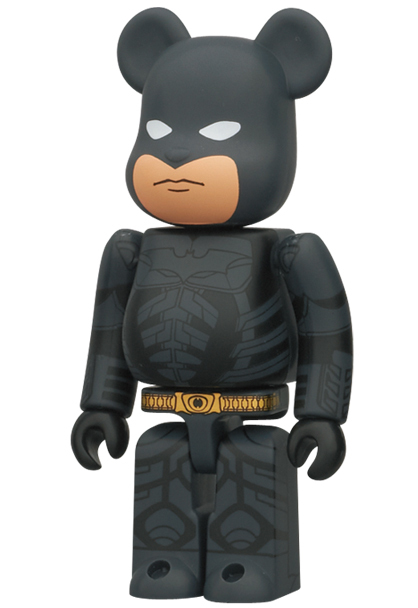 Along with Snoopy, Felix the Cat and Gossip Girl designs, this Be@rbrick series also includes the awesome The Dark Knight Rises Batman Be@rbrick seen here! Featuring Batman’s updated costume from Christopher Nolan’s third and final Batman film, this 3” figure actually looks pretty cool. I’ve really loved Medicom’s line of DC Comics Be@rbricks over the past few years and this figure, along with the new SDCC 2012 Exclusive Blue and Gray Batman 100% Be@rbrick releasing next month, will make great additions to everyone’s collections. Be@rbrick Series 24 is out now in Japan, and should be making its way stateside in the next few months. 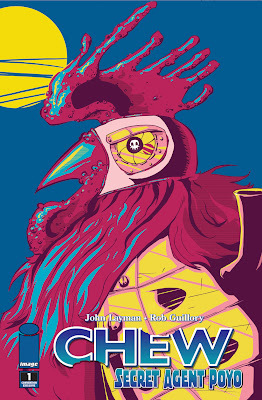 Chew, by John Layman and Rob Guillory, has quickly become one of The Blot’s favorite comic books. I love pretty much everything about this book, and if you haven’t read it yet go pick up the first trade ASAP! 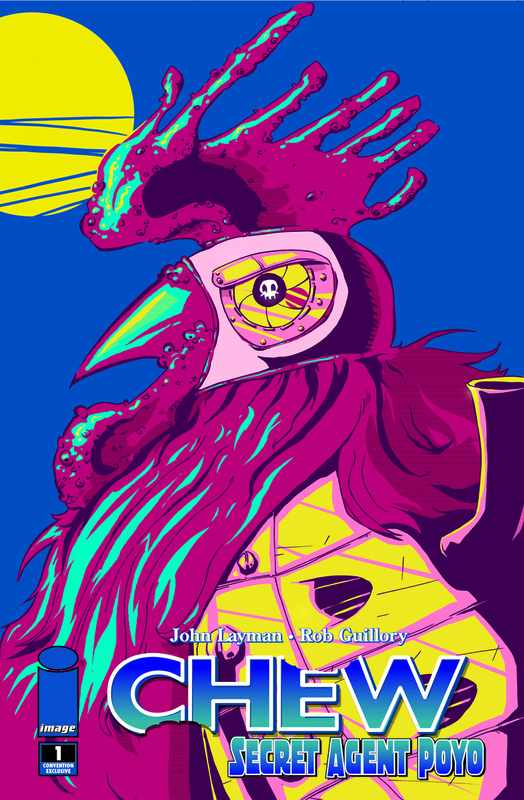 If you are reading Chew, then you’ll be excited to know that in just a few weeks Image Comics will be releasing a Chew one shot featuring the book’s most popular supporting character, and comic’s most beloved homicidal cybernetic kung-fu rooster, Poyo! What I especially love about this one shot is that Image will be releasing a San Diego Comic-Con 2012 Exclusive Pink Metallic Foil Variant Cover for it. It’s the ‘90s all over again, and I love it! There was a time when every comic released had a die cut, hologram or metallic foil cover and The Blot ate it up. Thankfully that trend died a quick death, but every once in a while it’s nice to have it rear its ugly head again. It really is so bad it’s good! The fun SDCC Variant can be purchased exclusively at the Image Comics SDCC booth for $10 each. For San Diego Comic-Con 2012, Mikie Graham has created a small run of custom Mini Jumping Brain vinyl figures entitled "This Is Your Brain." As you can see in the photo below, Mikie has crafted a miniature recreation of the 80's anti-drug scare ad "Your Brain On Drugs" using Emilio Garcia's mini jumping brain figures! How cool is that? Playing with the shape of the mini figure, Mikie used clear resin and a little hand painted detail to make the vinyl figures resemble a sunny-side up egg. 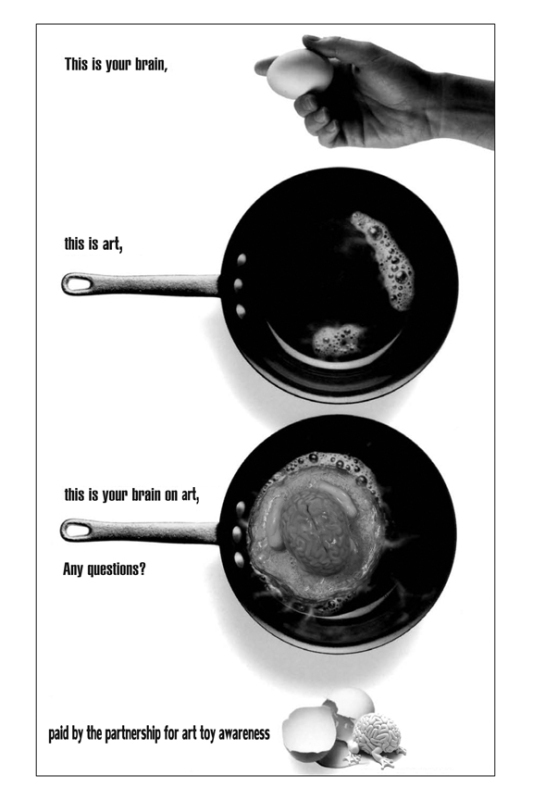 Finishing off the scale illusion, Mikie found miniature cast iron frying pans that perfectly fit his mini fried eggs. 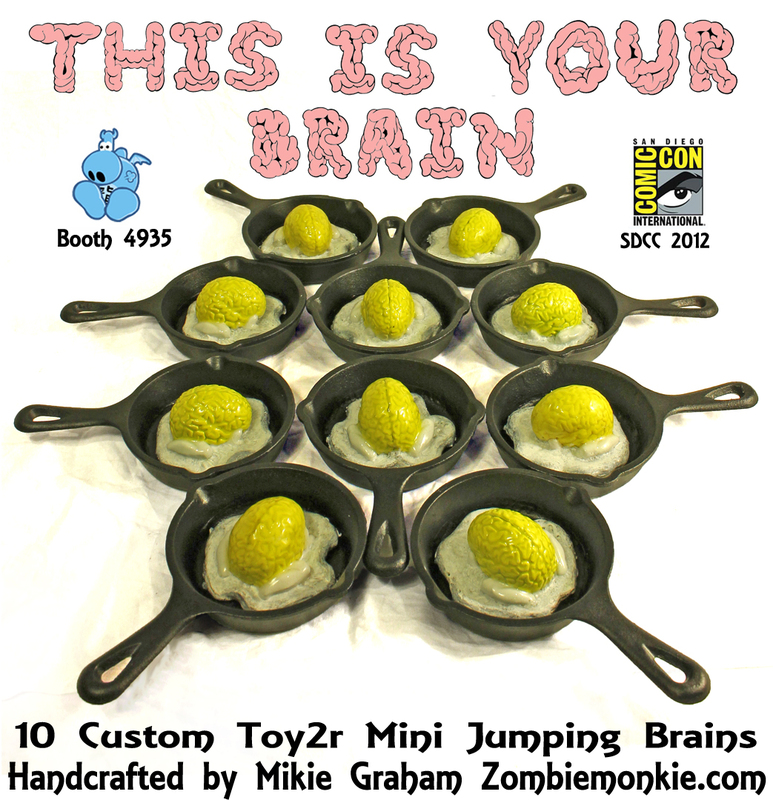 Mikie will have 10 of his San Diego Comic-Con 2012 Exclusive “This Is Your Brain” Custom Mini Jumping Brains for sale at Dragatomi's SDCC booth #4935, starting on Preview night, for only $45. Each figure comes hand signed and numbered by the artist and will be packaged in a black cardboard box with removable photo print mounted to its lid. 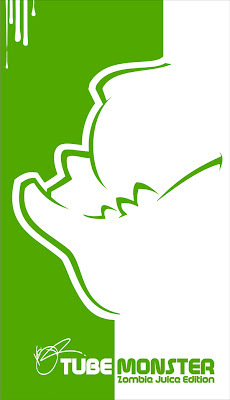 If The Blot was going to San Diego Comic-Con this year at the very top of my want list would be this beautiful wood screen print by Luke Chueh entitled “Root Down.” This image by Luke is just the perfect piece to be produced on wood, and would make an excellent addition to any fan’s collection. 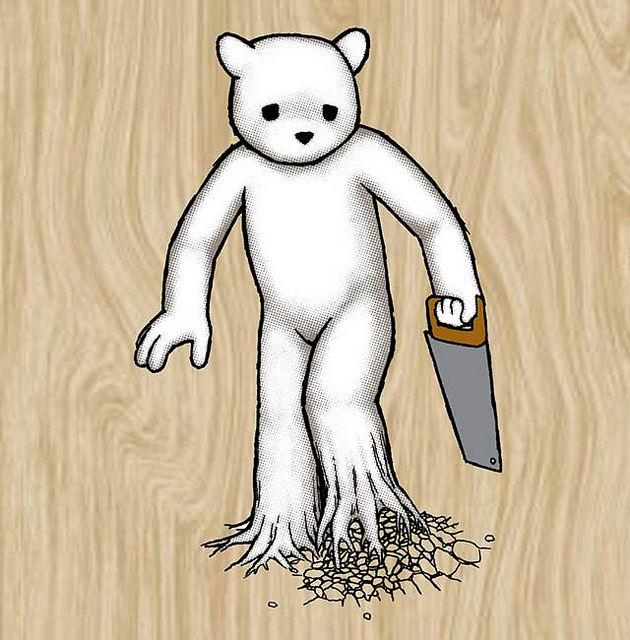 Since 2009, Hi-Fructose has brought limited edition wood prints by artists Hi-Fructose showcases in its magazine to SDCC. The San Diego Comic-Con 2012 Exclusive “Root Down” Wood Print by Luke Chueh is silkscreened on ½” birch (whose grain will make each print unique) and has a limited edition run size of just 50 pieces. This awesome wood screen print is scheduled to go on sale at Hi-Fructose’s SDCC booth #4939 Thursday, July 12th, at 3:30 PM. This has got to be the weirdest tie-in to this summer’s upcoming Judge Dredd live action film Dredd! 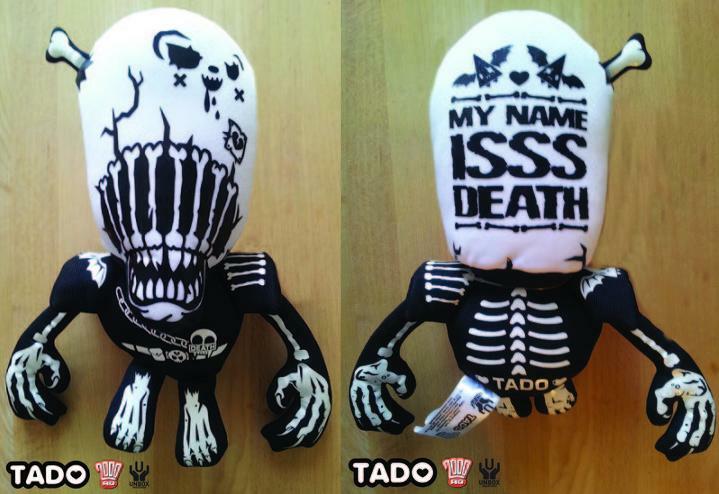 Unbox Industries has teamed up with 2000 AD to release this weird, yet cuddly, Judge Death plush figures designed by UK based design duo TADO. Judge Death, the classic Judge Dredd villain, is the leader of the Dark Judges, a group of creepy undead law enforcers. After that description, is this a character just screaming plush doll or what!?! The Unbox Industries x 2000 AD Judge Death plush figure by TADO has a limited edition run size of just 2,000 pieces, and can be purchased exclusively in the US from Clutter Magazine's online store for $12.49 each. Pre-order one of these killer 8.5” Judge Death plush figures today! Rampage Toys is about to unleash a new line of sofubi on the world, the Cyclops Dinos: T-clops, Anklyo-clops and Bronto-clops! 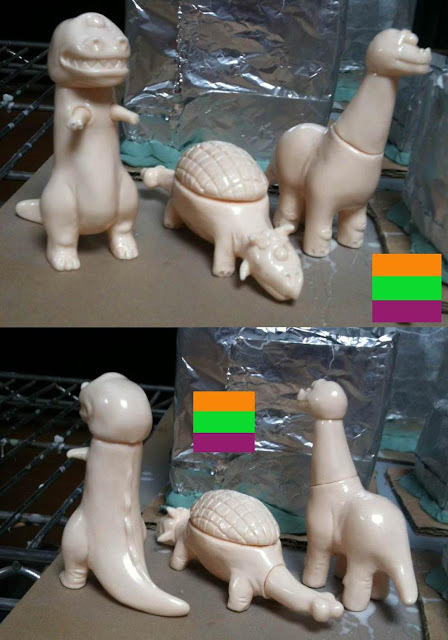 This first release of Cyclops Dinos is being sold as a set of three figures in a variety of blank, unpainted colored vinyl. 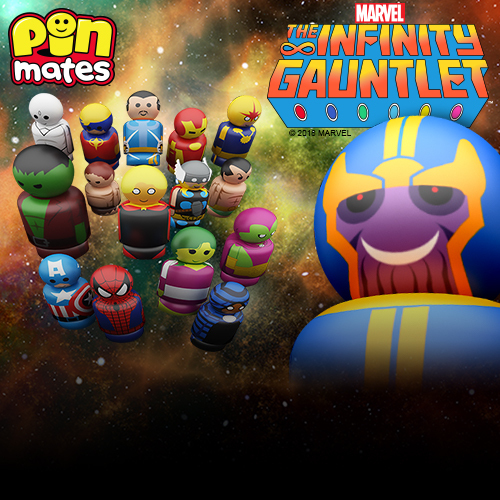 Each figure is around 3 inches tall/long, and features 2 or 3 points of articulation. These will be super fun to play with, and a blast for mixing vinyl parts and colors! Pre-order a set today at the Rampage Toys online store for $55 per set. For this first unpainted Cyclops Dinos release collectors can order this set in orange, green or purple and Rampage Toys is also offering a very special mixed parts order. You can mix colors to your heart’s content! Here's how it works: you can order as many sets as you want, and when you pay for your sets via Paypal leave a note in the “notes to seller” section telling Rampage Toys if you want a solid color set and what color you want, or if you want mixed parts. If you want mixed parts, indicate what colors of vinyl you want and if you have any specific requests for how the parts should be mixed (i.e. "green heads and orange everything else" or "surprise me"). If you want the eyes and mouths painted on your figures, please note that as well (no charge for this option!). This pre-order will only be up for a week or two so don’t delay in getting in your order! At keep your eyes peeled on the Dragatomi SDCC booth in a few weeks for Rampage Toys’ first Cyclops Dinos painted release. Meet The Unhappbees, Vanessa Ramirez exciting new set of resin art pin sculptures dropping later today! These unhappy little fellows are 2"w x 3"h, and are the cutest little unhappy bees you’ve ever seen. Vanessa has created six different colorways (red, blue, green, purple, yellow and silver) of these one of a kind hand cast, hand painted resin bees. This is the third resin release by the talented California artist in the past year, and her sculpting skills just keep getting better! 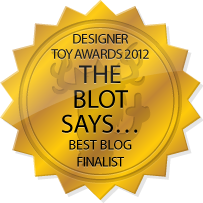 The Blot can’t wait to see what she comes up with next. 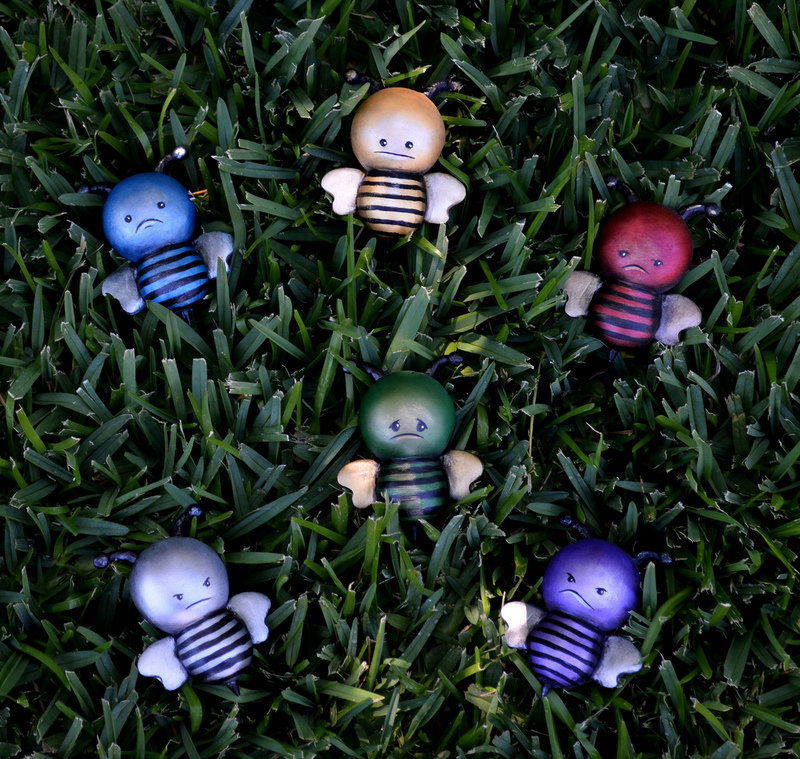 The Unhappbees by Vanessa Ramirez go on sale at her online store today, Tuesday, June 26th, at 6pm PST for $25 each. Just like they were when you were a kid, only BIGGER! As they have for the past two years, Gentle Giant will be releasing a San Diego Comic-Con exclusive figure from its popular line of 12 inch vintage Star Wars action figure reproductions. This year’s SDCC exclusive is a reproduction of the extremely rare “blue” Snaggletooth from 1978. Released as part of the Sears “Star Wars Cantina Adventure Set,” the Snaggletooth figure was intended to represent the character who would later be known as Zutton. However, the only reference used for the figure was a partial black and white photograph of the alien’s head. The body was unknown, so the sculptors and artists improvised, creating a tall alien with a tight blue spacesuit and silver boots. From 1979 onward, including later Sears releases of the cantina set, all versions of Snaggletooth were changed to a red color, with bare feet and hands and shorter legs (seen here). 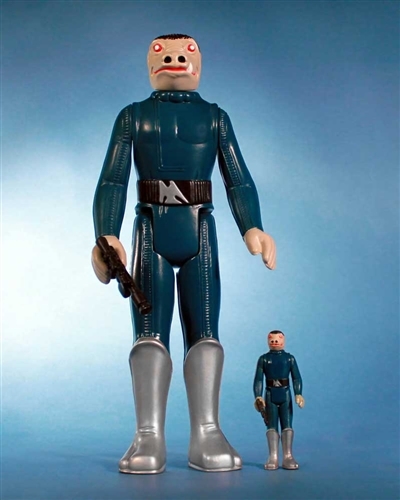 Digitally scanned from mint Kenner originals and reproduced to a substantial 12" tall, this Jumbo Vintage Kenner Star Wars Blue Snaggletooth action figure by Gentle Giant is an exact replica of the classic ‘70s toy. Injection molded and made of durable plastics, this jumbo figure includes a faithfully reproduced blaster, is fully articulated and comes packaged on a 1977 style Star Wars inspired blister card with a plastic outer clam shell to help protect and display this awesome action figure. The San Diego Comic-Con 2012 Exclusive Star Wars 12 inch Jumbo Vintage Kenner Blue Snaggletooth action figure by Gentle Giant has a limited edition run size of 2,000 pieces, and will retail for $80 exclusively at Gentle Giant’s SDCC booth. Vannen and Robert Kirkman are teaming up for the third time this year to produce a very special San Diego Comic-Con 2012 Exclusive The Walking Dead watch commemorating the 100th issue of the hit comic book series. Featuring the artwork from Charlie Adlard’s wraparound cover to The Walking Dead issue #100, this Comic-Con exclusive will be sold at Skybound SDCC booth #2729. 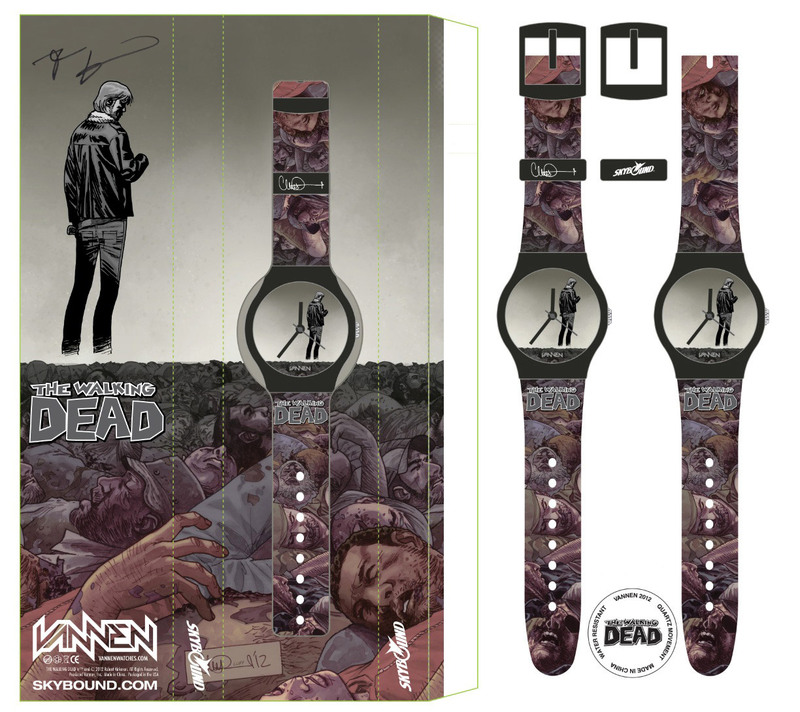 The hype around the release of The Walking Dead #100 this summer is going to be huge and everything connected to it will flying off the shelves, especially this limited edition watch from Vannen. If this release is anything like Vannen’s first two collaborations with Skybound they won’t be available for long at SDCC. Any time I’m in the market for the rarest of the rare Funko releases, my first stop is always Gemini Collectibles. Sometimes I don’t even know what I’m looking for. The perfect example of that is this Black and White “Color Reject” Set of Funko’s The Beatles Pop! Rocks Yellow Submarine figures. I didn’t even know these existed! According to Gemini Collectibles, these black and white figures were supposed to be a Gemini store exclusive. 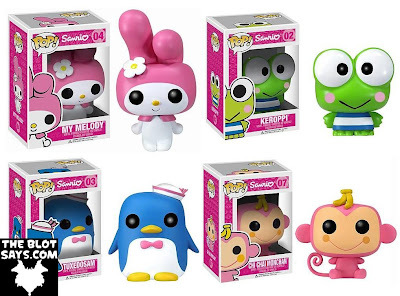 Originally, Funko was given the green light to produce these figures by the licenser and 10 sample sets were created. But before they were submitted to the licenser for approval, the licenser changed their mind and the project was scratched. 9 of these 10 sets are now available for purchase. Each box comes hand signed and numbered by Funko's Brian Mariotti on its bottom with the words "color reject" (which had to be written on the box). This extremely rare Black and White “Color Reject” Beatles Pop! Rocks Yellow Submarine Set includes five figures: John Lennon, Paul McCartney, George Harrison, Ringo Starr and the Blue Meanie and can be purchased exclusively at the Gemini Collectibles online store for $1,375 (per set). Next month marks the release of artist Mike Egan’s very first vinyl figure entitled Bones, and The Blot is pretty pumped! Produced by Lulubell Toys’ Luke Rook (aka Grody Shogun), Bones is a hand painted 8” tall vinyl figure made of soft Japanese vinyl with a limited edition run size of 80 pieces. Luke always makes amazing figures, and this one looks great. I can’t wait to see it in person. This San Diego Comic-Con 2012 Exclusive Bones vinyl figure can be purchased exclusively at DKE Toys’ SDCC booth #4728 for $45 each. What an amazing price for this scale of a figure. This summer Luke Chueh will be teaming up once again with Munky King to release a killer San Diego Comic-Con exclusive! This year’s release is Target, a brand new vinyl figure based on Luke’s classic painting of the same name. This two piece set includes a 6.5” vinyl bear with a 10.5” resin bullet-ridden backdrop. What’s really beautiful about this piece is how the highly detailed resin base contrasts with the minimalist aesthetic of Luke's iconic bear. 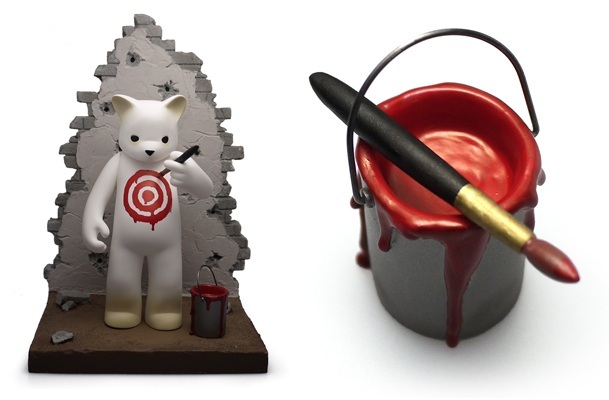 Each Target vinyl figure includes a removable brush and bucket, and comes packaged in a box featuring Luke's revisit of his original illustration. What The Blot really loves about this piece is that the backdrops were designed to interlock with one another, so if you decide to purchase future Target colorways you can create your own deadly Luke Chueh diorama. 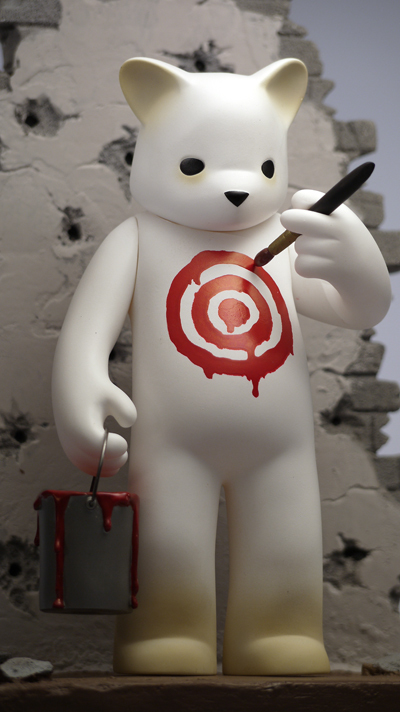 The San Diego Comic-Con 2012 Exclusive Target vinyl figure by Luke Chueh and Munky King has a limited edition run size of 250 pieces and will retail for $140. Pick one up at Munky King’s SDCC booth #4539. Luke will also be on hand at Munky King’s booth throughout SDCC signing is new figure and even customizing each Target wall with a hand-drawn graphic! Can’t wait to see these after the show. While we still don't know who is actually going to take home the Lord Magma Skullendario Azteca 8" custom figure by Huck Gee and The Beast Brothers, we are one step closer to finding out! 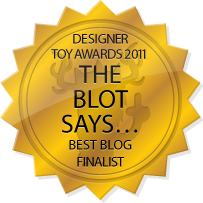 After 11 days later and over 140 entries we now have a winner of The Blot Says' giveaway, and it's...@teodoru!!! @teodoru is now one of six finalists who has a chance at winning this amazing figure! Later today, Friday, June 22nd, Huck and The Beast Brothers will place all six entries into a hat for a live drawing on Ustream at 12:55pm EST. Be sure to turn in here for the big drawing! 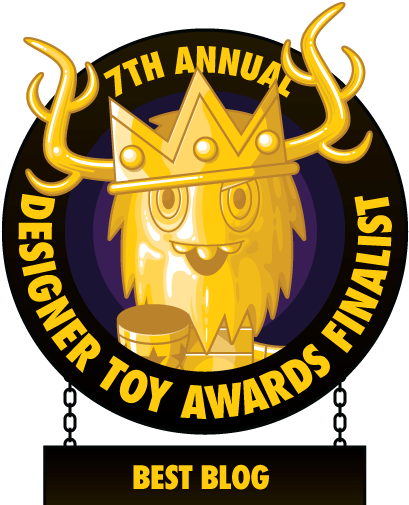 Good luck to all of the finalists, but The Blot is definitely pulling for @teodoru! And a huge THANK YOU goes out once again to Huck, Carlos and Ernesto for holding such an amazing giveaway and including TheBlotSays.com in all the fun!!! 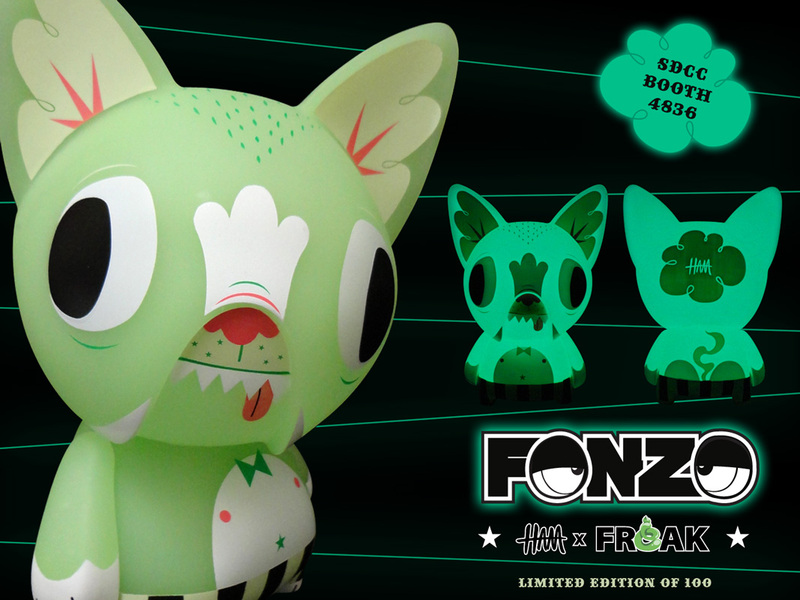 The third colorway of Freak Store’s Fonzo vinyl figure has been announced, and it’s this awesome San Diego Comic-Con 2012 Exclusive Glow in the Dark colorway! The Blot’s a sucker for GID vinyl, and combine that with Gary Ham’s fun design and you’ve got a must get at this summer’s preeminent pop culture extravaganza. This 6” figure, based on Freak Store’s pet French bulldog Fonzo and designed by Ham, has a limited edition run size of 100 figures and can be purchased exclusively at Gary’s SDCC booth #4836. While you’re there, you can also get Gary to sign the figure for you. Mimoco announced its newest collaboration this week and it’s HUGE! Not only are they teaming up with the Cartoon Network to release the Adventure Time x Mimobot Designer USB Flashdrive Collection, but they are also releasing an extremely rare Fionna Adventure Time Mimobot at San Diego Comic-Con 2012. 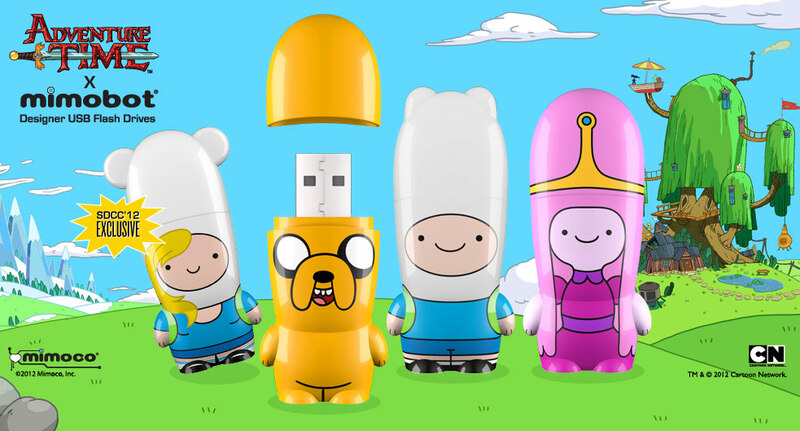 So now, instead of transporting your super-important data on a boring old flash drive, you can bring your data with you on an amazing adventure with a Finn, Jake, Princess Bubblegum, or Fionna Mimobot! Each comes preloaded with awesome Adventure Time content (like full episodes of the show) and all available in a range of 4GB to 64 GB memory capacities starting at just $14.99. 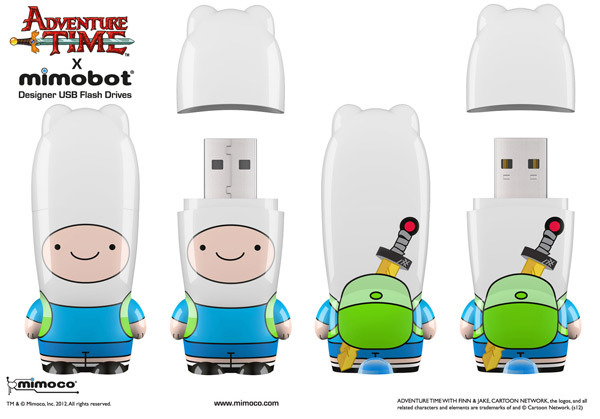 Finn, Adventure Time’s main man, is beyond just a kid and the Finn Mimobot is beyond just another flash drive. Armed with his awesome hat, backpack and sword, there is no evil too scary for him to face, no adventure too big to be adventured, and for the Finn Mimobot, no file too important. Oh yeah, and when you whip Finn Mimobot out, everyone will know that you are King Awesome. Jake loves Finn. 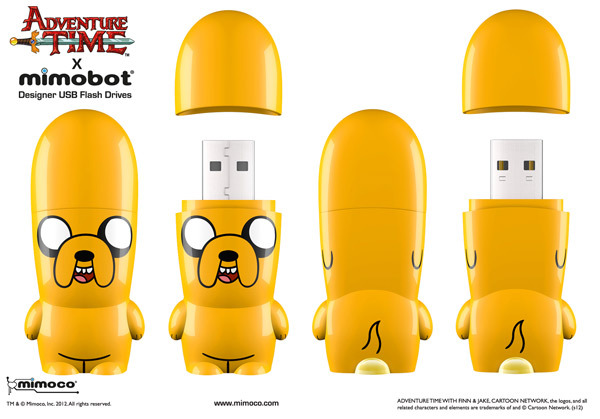 But Adventure Time’s Jake is not your average dog…he’s stretchy too! The Jake Mimobot can be just as loyal and loving a friend, and is just as flexible. 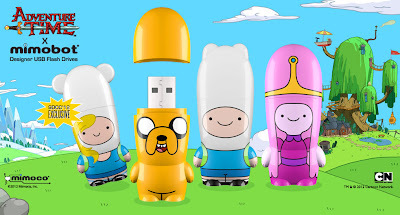 Jake Mimobot is there in a pinch and will proclaim to your friends and coworkers that yes, you love Adventure Time, and no, you will not let them down. Princess Bubblegum is the ruler of the Candy Kingdom and, sometimes, the ruler of Finn’s heart. But just because she’s fickle in love doesn’t mean she doesn’t care. 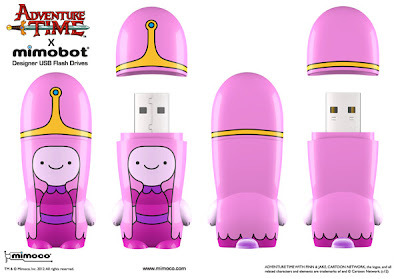 Princess Bubblegum will always be there to help Finn, just as the Princess Bubblegum Mimobot will be at your side, in your pocket, or sitting next to your computer, ready to store and transport your documents, pics, music, and more within her cute, pink, and candytastic Mimo-shell. Fionna Mimobot is just as big an adventurer as the Finn Mimobot, without all that stupid boy stuff! Her awesome hat has bunny ears, her sword is pink, her hair is long, and her adventures are huge! So she’s not available yet, but Fionna Mimobot will join her Adventure Time x Mimbot Collection friends this July at SDCC! The San Diego Comic-Con 2012 Exclusive Fionna Mimobot has a limited edition run size of just 500 pieces and can be purchased at Mimoco's SDCC booth #4936-4938 and at the Star Wars Pavillion Booth #2913m starting at $14.99. If you can’t make it to SDCC, Mimoco is compiling a waiting list for any unsold inventory. The remaining Mimobots will be offered on a first-come, first-served basis to those who register for the waiting list by emailing SDCC@mimoco.com and reference the design you’d like to reserve in the subject of your email. Erick Scarecrow always has the coolest convention exclusives and this year is no different! Check out his San Diego Comic-Con 2012 Exclusive Gold Daibutsu, which you can only buy at DKE Toys’ booth #4728 on Thursday, July 12th, at 12pm. This 7” tall figure has a limited edition run size of 18 pieces and will retail for $140. 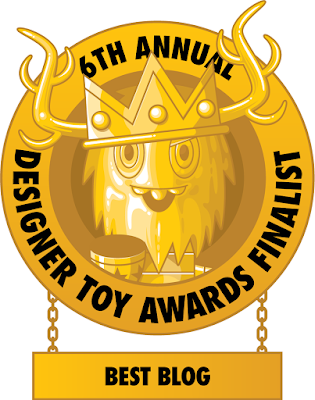 ESC Toy fans are pretty diehard, so expect these shiny figures to go extremely quickly! The Blot loves this particular colorway of Daibutsu. It's almost like this resin figure was made to be produced in shiny gold! Just keep your eyes open in case a man wearing a fur felt hat and bullwhip comes eying your collection. “The Mexican Shootout” by Rich Kelly is the eight screen print in the Breaking Bad Alternate Reality Game Series released in honor of the hit AMC television show Breaking Bad’s fifth and final season. This print depicts one of the coolest scenes in the history of Breaking Bad, and that’s saying a lot! While I love this image of Jesse, Gus and Mike, I’m not so sure how well it works as a print. Yes the coloring is amazing, but is this really an image you’d want on your wall? 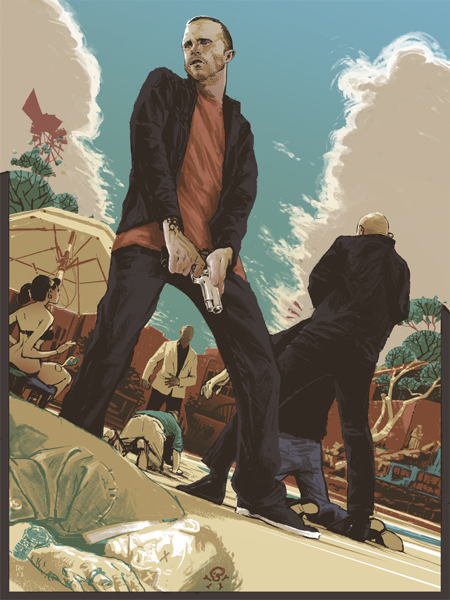 Rich Kelly’s limited edition Breaking Bad screen print “The Mexican Shootout” measures 18”x24”, has a run size of 300 pieces (only 200 available for purchase) and comes hand signed and numbered by the artist. The print will retail for $50 each and can be purchased here. To celebrate and honor the fifth and final season of Breaking Bad, 16 of the top artists and graphic designers have been commissioned to create screenprints depicting some of the series' most memorable scenes, characters and shocking moments for Gallery1988 and its Breaking Bad ARG, Breaking Gifs. These screenprints are hand-pulled, each its own individual work of art, in an edition of just 300, with only 200 available to the public through this project. Once the edition is sold out, they will never be printed again. As you may or may not know, The Blot is a gigantic Savage Dragon fan! I’ve been reading Erik Larsen’s long running comic book since the very first issue was released back in 1992, which means I’ve now been reading the Image comic for well over half of my life. So when Illinois skateboard company Freak Show (Facebook) announced earlier this week that it was launching its new line of comic book themed Longbox skateboards with a Savage Dragon skate deck I got really excited! While I’ve never been much of a skateboarder, I am seriously tempted to pick up one of these beautiful decks to add to my Dragon collection. Wouldn’t it look sick with a Savage Dragon doodle on it by Larsen!?! 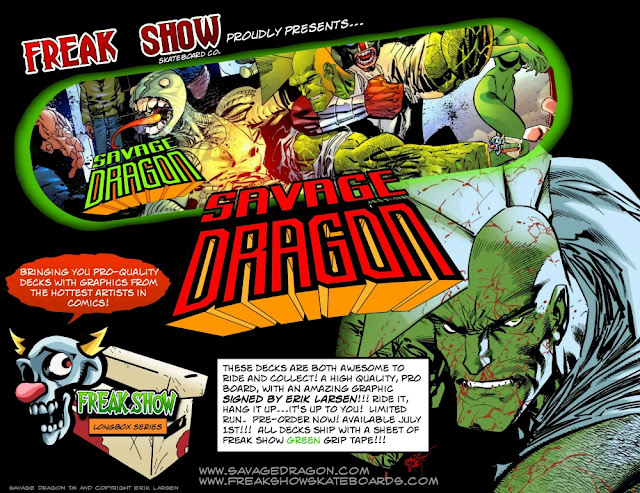 While I haven’t been able to find out too much information on the company itself, I did learn the Savage Dragon skateboard is now available for pre-order through Freak Show's online store in three different options: there’s the basic Savage Dragon deck for $54.99, a signed Savage Dragon deck signed by the character’s creator Erik Larsen for $74.99, and a complete working Savage Dragon deck for $149.99. All decks are scheduled to ship the first week of July, and can be purchased at the Freak Show online store or by emailing them at freakshowskateboards@gmail.com. We finally made it! 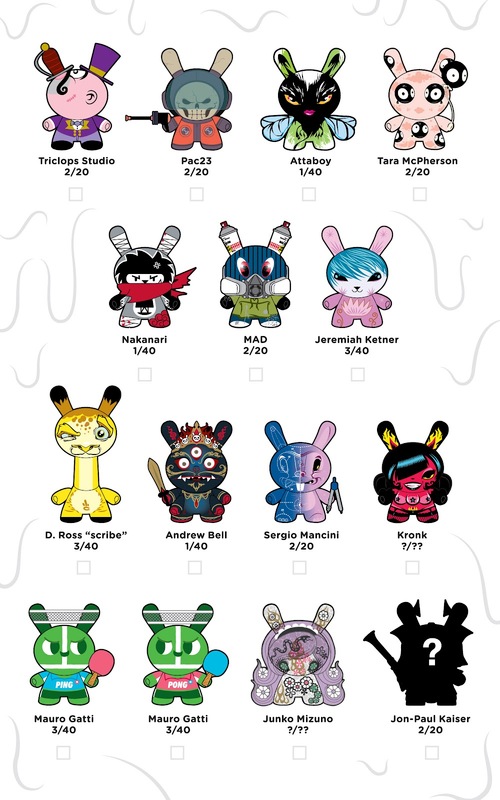 Kidrobot’s Dunny Series 2012 drops today and I know everyone’s excited to get their hands on a few blind boxes and/or cases. Before you head out to your local DS2012 trading party, be sure you print out the official checklist and ratios provided by Kidrobot. This is a fantastic series, and everyone involved should really be proud. 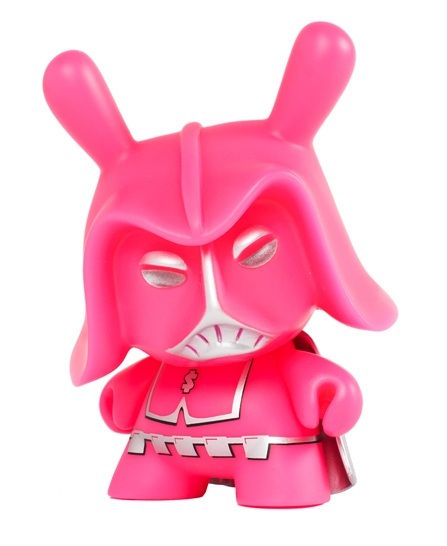 Now, if only I could get my hands on a certain bright pink Dunny! Dunny Series 2012 features designs by Andrew Bell, Attaboy, Scribe, Jeremiah Ketner, Jon-Paul Kaiser, Junko Mizuno, Kronk, MAD, Mauro Gatti, Sergio Mancini, Nakanari, Pac23, Tara McPherson, Triclops Studio and The Sucklord! DS2012 goes on sale today, Thursday, June 21st, at Kidrobot stores, Kidrobot.com, and select retailers worldwide for $9.95 per blind box. The Blot’s favorite Rose Vampire colorway is coming back in a sweet new ride…a casket! 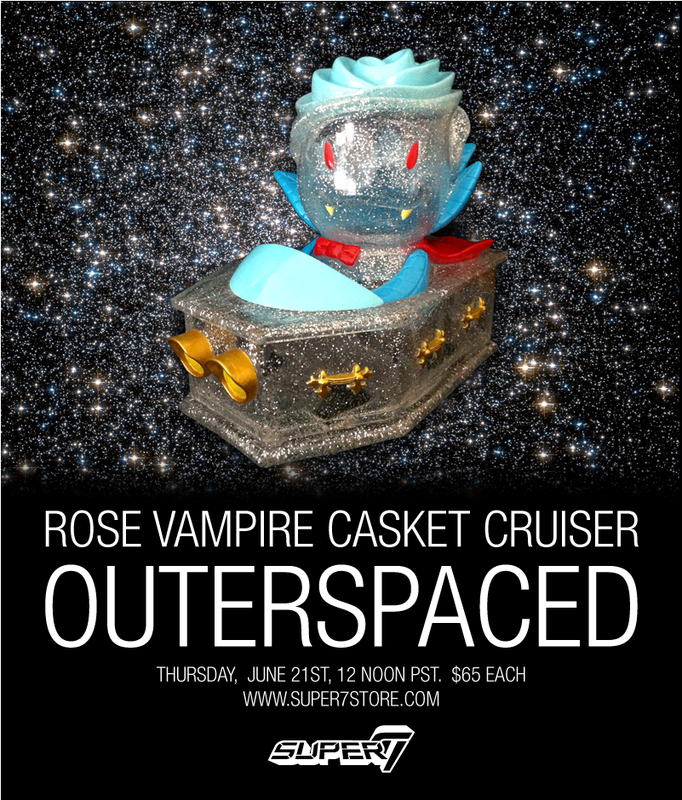 The Outerspaced Rose Vampire Casket Cruiser by Josh Herbolsheimer is blasting off into space in this all new (and sparkly) colorway! Deep into the heart of the Milky Way blazes the Cosmic Rosferatu, kicking it into high gear and letting his cape flap in the solar wind. Transparent glitter vinyl camouflages the Rose Vampire against the night sky, his roaring engine the only signal of his approach. 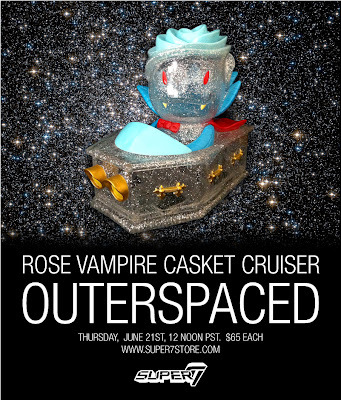 The OuterSpaced Casket Cruiser is a high quality Japanese vinyl figure, approximately 4 inches long, with free-rolling wheels. Pick one up at the Super7 online store this Thursday, June 21st, at noon PST for $65 each. Hasbro is releasing a super-sized Helicarrier at San Diego Comic-Con this summer as a tie-in to hit film The Avengers! Made for Hasbro’s popular line of 3.75” Marvel Universe action figures, this SDCC exclusive will measure over 4 feet long (basically the size of an ironing board) and will feature brand new Joe Quesada artwork on its packaging. 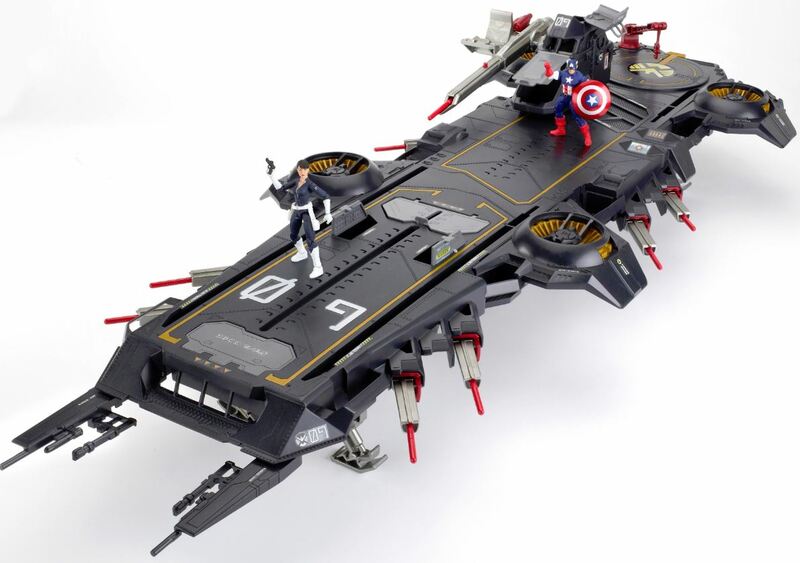 This super-sized Helicarrier will also include two special edition Marvel Universe action figures: a brand new version of Captain America and a SHIELD Agent Maria Hill! While The Blot can do without a 4’ vehicle, I wouldn’t mind getting my hands on a Cobie Smulders action figure. For those of you not attending San Diego Comic-Con this year, don’t worry. Hasbro will be releasing a standard edition version of the SHIELD Helicarrier in stores soon! But, if really want this over foot longer version, then head over to Hasbro’s SDCC booth #3329 where you can pick one up for $129.99. 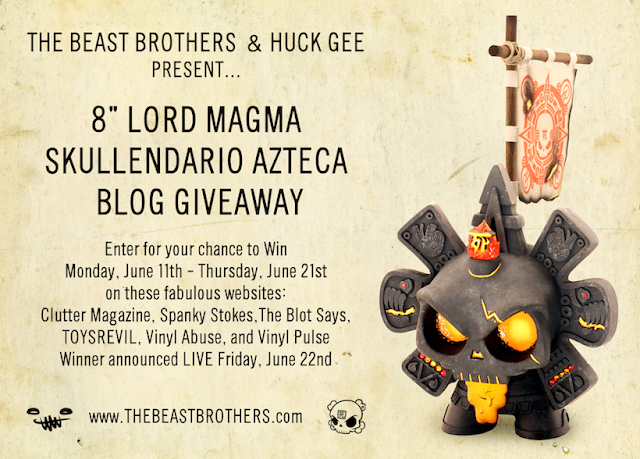 For the past week and a half you’ve had an opportunity to enter to win a Lord Magma Skullendario Azteca from The Beast Brothers and Huck Gee here at The Blot Says… Well, now here’s the info on how to buy one! Lord Magma is the final clorway in the Skullendario Azteca series brought to you by Huck Gee and The Beast Brothers. This 8 inch hand crafted custom figure will go on sale for 24 hours only at The Beast Brothers online store starting this Friday, June 22nd, at 1pm EST. 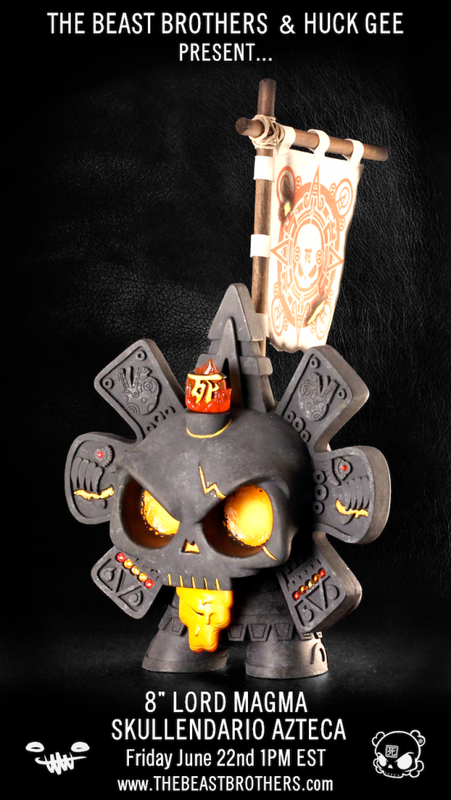 Each hand painted sculpture comes signed by The Beast Brothers and Huck Gee, is adorned with Swarovski crystals, includes a custom flag, and is safely entombed in a laser engraved wooden crate. 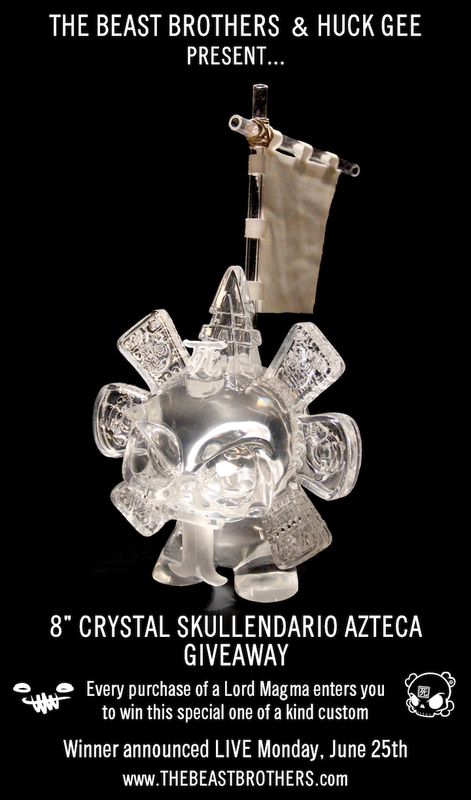 The Lava Magma Skullendario Azteca will retail for $475 each and as an added bonus, each purchase enters buyer into a very special giveaway to win a one-of-a-kind Crystal Skullendario! Excavated from the former lands of the Skullendario Aztecas, this is the only known relic from the now extinct civilization. 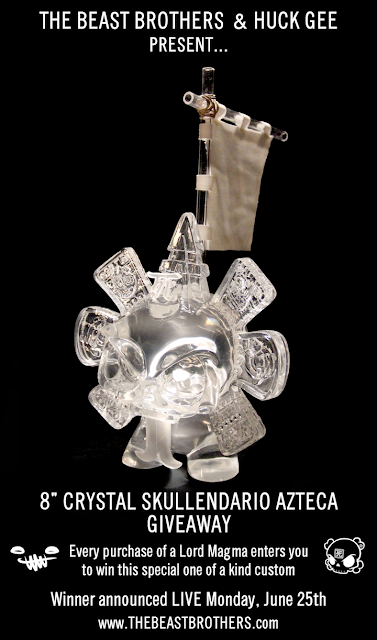 This one-of-a-kind 8 inch Crystal Skullendario Azteca is made of clear resin and could be yours if you purchase the Lord Magma Skullendario! If you haven’t been able to tell so far, San Diego Comic-Con 2012 is going to be all about The Walking Dead. The Blot counts at least five Walking Dead SDCC exclusives announced so far! One of those is this comic book edition Bloody Hooded Michonne variant action figure by McFarlane Toys. 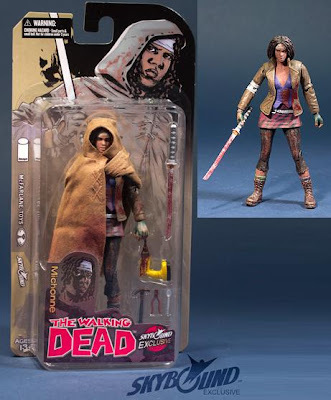 Standing 6 inches tall, to me this is the definitive Michonne action figure. It even comes in a cool full color blister card featuring artwork by The Walking Dead artist Charlie Adlard. 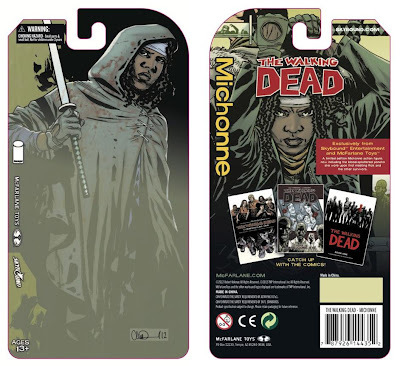 The San Diego Comic-Con 2012 Exclusive Bloody Hooded Michonne The Walking Dead variant action figure recreates the character’s look from her first appearance in The Walking Dead comic book series (issue #19 for those of you keeping track). This figure comes with a number of accessories, including her trademark katana sword and various other weapons, and features 22 points of articulation. Fans can purchase this exclusive figure at the Skybound SDCC booth #2921 for $25 each. 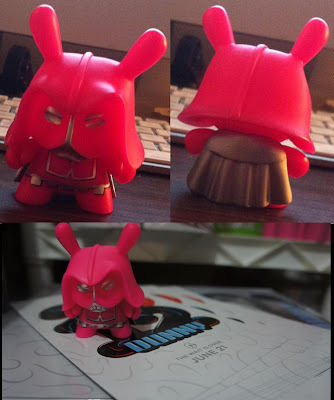 UPDATE: The Final Version of Sucklord’s Gay Empire Dunny Series 2012 Case Incentive! While Kidrobot’s Dunny Series 2012 won’t be officially released until Thursday, collectors all around the globe have already gotten their hands on cases. The Kidrobot message boards are blowing up with case layouts and pictures of every figure in the series, including The Sucklord’s Gay Empire Case Incentive Dunny! After seeing the concept art for this design a few days ago The Blot was excited, but after seeing the final product I’m desperate to get my hands on one! This figure seriously turned out even better than I had anticipated, and I can’t wait to see one in person at Domy Books’ official DS2012 trading party on Thursday night. Dunny Series 2012 goes on sale Thursday, June 21st, at Kidrobot stores, Kidrobot.com, and select retailers worldwide for $9.95 per blind box. Funko is not messing around this summer! Every few days they seem to be announcing another unexpected release. First a line of Hello Kitty Pop! 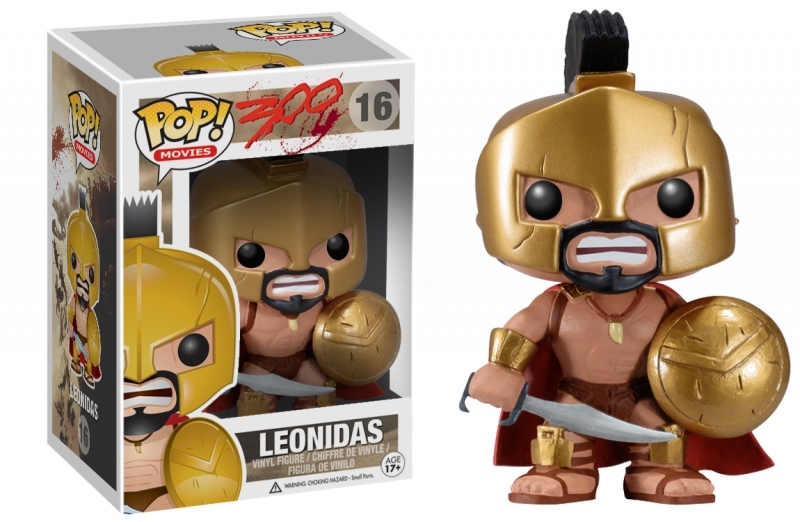 and now a Leonidas 300 Pop! Movie vinyl figure. Does this guy look ready to lead 300 Spartans into battle against insurmountable odds or what!?! The Leonidas 300 Pop! Movie vinyl figure feature one point of articulation, stands 3.75” tall and come packaged in a full color displayable window box. Coming in July, the Leonidas Pop! vinyl figure will retail for $9.99 each. Funko just keeps pulling out surprise after surprise! Its latest is this exciting collaboration with Sanrio. I know a lot of Hello Kitty fans out there that can’t wait to get their hands on these figures, and from the pictures I’ve seen they look pretty awesome. The Hello Kitty Pop! Series includes Hello Kitty, My Melody, Badtz-Maru, Chococat, Keroppi, Tuxedo Sam and Chi Chai Monchan. 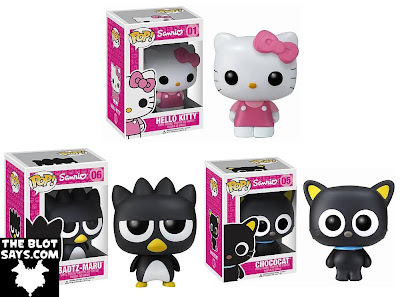 Sanrio x Funko Hello Kitty Pop! vinyl figures feature one point of articulation, stand 3.75” tall and come packaged in a full color displayable window box. These figures will be available in stores shortly, but in the meantime you can pre-order them online from Entertainment Earth for $9.99 each here. Thanks to some flippers who have already gotten their hands on some cases of Kidrobot’s upcoming Dunny Series 2012, we now have a pretty good picture of the red chase colorway of Andrew Bell’s awesome looking Mahākāla 3” Dunny. This figure turned out amazing and with a matching 8” Dunny coming at San Diego Comic-Con 2012 you know this red chase is going to be highly sought after. Good luck finding one, because the rumor is this version will be extremely rare. Collectors can start purchasing Dunny Series 2012 blind boxes this Thursday, June 21st, at Kidrobot stores, Kidrobot.com, and select retailers worldwide for $9.95 per blind box. Blamo Toys has teamed up with Dragatomi to create an all new colorway for its popular Hug resin figure. 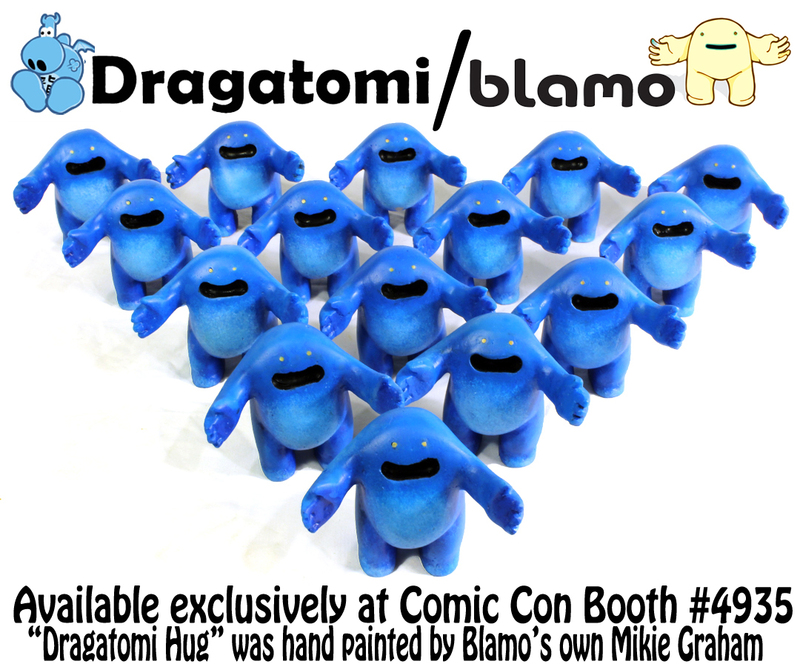 The “Dragatomi Hug” comes hand painted by Blamo’s Mikie Graham in Dragatomi’s trademark shade of blue, comes packaged in a bag and cardboard header card, and has a limited edition run of just 15 pieces. 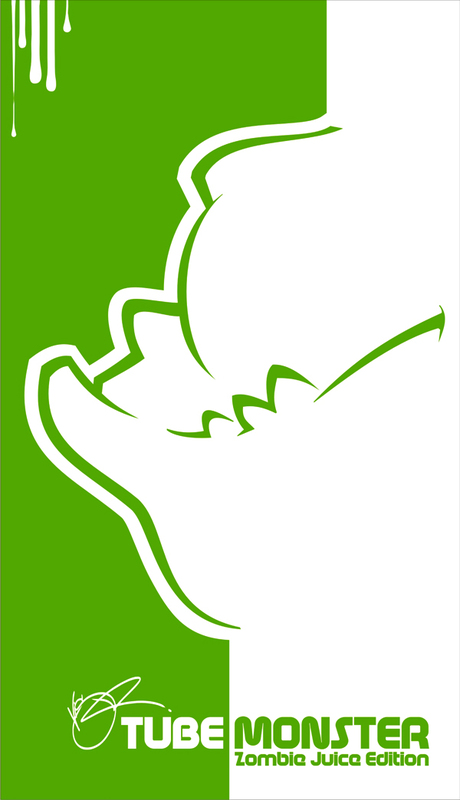 Like all of Blamo's products, each and every Dragatomi Hug is handmade and a truly one of a kind piece of art. The San Diego Comic-Con 2012 Exclusive Dragatomi Hug by Blamo Toys goes on sale beginning on Preview Night (Wednesday, July 11th) at Dragatomi’s SDCC booth #4935. Snag one while you can for just $25 each. 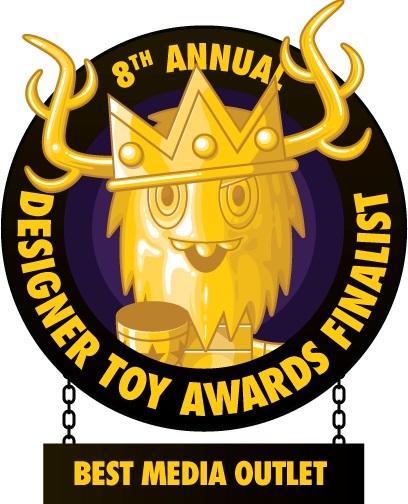 In addition to the Dragatomi Hug, Blamo plans on having a small selection of their unique brand of art toys (from hand carved wooden Billy figures to new plush designs) available all week long at Dragatomi’s booth. VISEone is about to launch an all new toy line based on his popular dripping tube customs. Since VISEone started with his tube custom concept, he was hoping to be able to release his own character dripping out of a tube one day. Thankfully for VISEone’s fans, that day is finally here! The German artist is teaming up with Flying LuLu to produce the 8” Tube Monster prototypes you see above. There are still some corrections that need to be made before it's ready for the wax model, but it looks like things are full steam ahead! 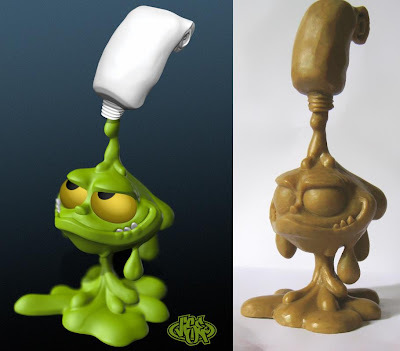 The first Tube Monster colorway is the Zombie Juice Edition, which will tentatively be released at New York Comic-Con 2012. After that, who knows what awesome colorways might be in the works! Until we can see the final product, check out the 3D model and preliminary sculpts above, as well as the figure’s official packaging artwork. 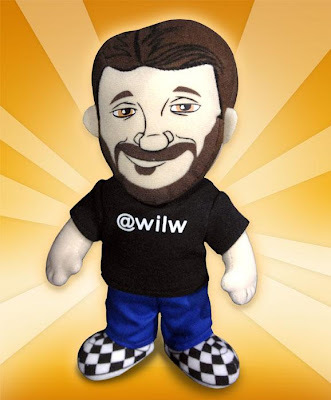 Joel Watson, creator of the hit webcomic HijiNKS ENSUE, has teamed up with Wil Wheaton to produce the very first (and probably only) Whil Wheaton plush doll. 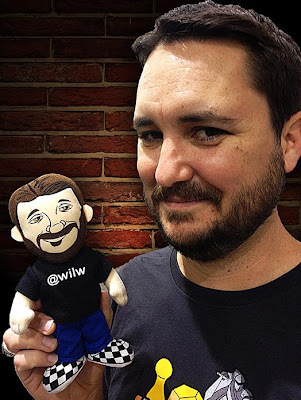 Whether you’re a huge Star Trek: The Next Generation fan or just an internet geek who follows Wil’s every move on TV, Twitter and via his blog you’re going to love this Lil’ Wil Wheaton Plushie. According to the legend of the Lil’ Wil Wheaton Plushie, Wil dared Joel via Twitter to draw him as a plushie. Almost a year later the little guy now exists in the real world. For just $19.95 you can own your own Wil Wheaton plush to cuddle with at night while wearing your Star Trek pajamas! Just make sure it’s not a set of red shirt Star Trek pajamas. You can pick up this snarky Wheaton doll at the HijiNKS ENSUE online store.